The iJust X, a modern and slick looking e-cigarette kit by Eleaf, has a unibody design with a tank and a 3000mAh battery encased in two metal tubes separately. The tank section can hold a massive amount of e-liquid of 7ml, extending the time between refills. You can fill the tank from the top conveniently by just removing the top cap. 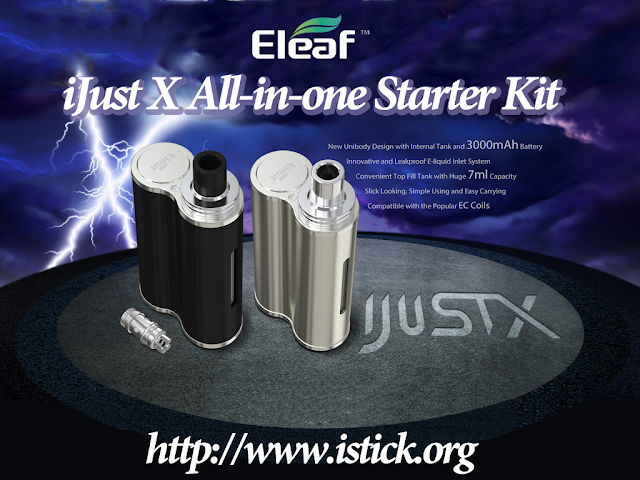 Also the iJust X will provide you with a great vaping experience when using the popular EC coils. iJust X Launced at our store, you can click here to visit it. The price is $29.9, you can save much money, because the original price is $39.9.